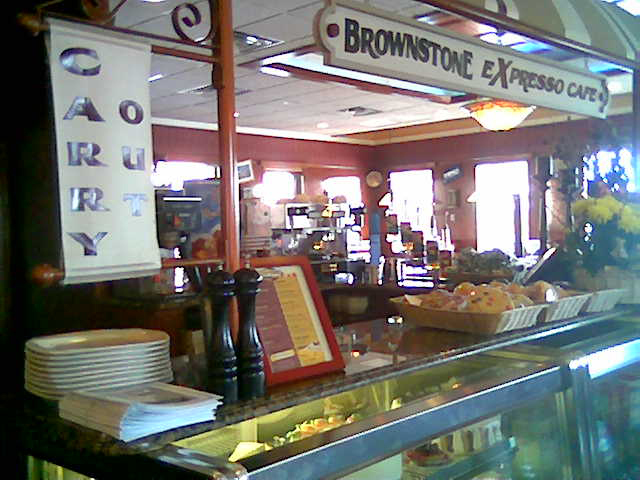 The Brownstone offers diner fare, the eggs, burgers and sandwiches are always on the menu, but it’s definitely more than a diner. It’s a nice, easy-going restaurant that serves great food from traditional recipes that go back to when owners Zoe and Bobby Bournias were kids learning the restaurant business from their parents Irene and Peter who owned M&A diner back in the 1960s and ’70s. They converted it to the Newport Pancake House in the 1980s and when their father Pete was going to sell the business in 2004, Zoe and Bobby decided to leave their careers and run the business with their dad. 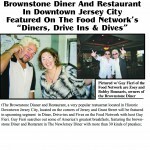 They renovated and expanded and in 2005 re-named the eatery the Brownstone Diner & Pancake Factory, transforming it from a plain-and-simple diner to a family restaurant with a menu that goes far beyond blue plate specials. Zoe and Bobby added Pancake Factory to the diner’s name and included an extraordinary selection of pancakes to their menu. Choices include Buttermilk, Cran’Apple, Pecan, Peach, Strawberry and Banana Walnut Pancakes ($4.95-$7.95) and Blueberry, Cherry, Apple, Nut ‘n’ Honey, PB&J and Chocolate Chip Pancakes ($6.75 to $8.75.) There are Potato Pancakes (with apple sauce and sour cream) Coconut Pancakes, Honky Tonk Pancakes (peanut butter chunks and fresh bananas) and Black Forest Pancakes (chocolate chips and cherry compote) ($6.95-$7.95.) These flapjacks are so yummy New Jersey Monthly named them “Best of New Jersey” in its March 2009 issue. 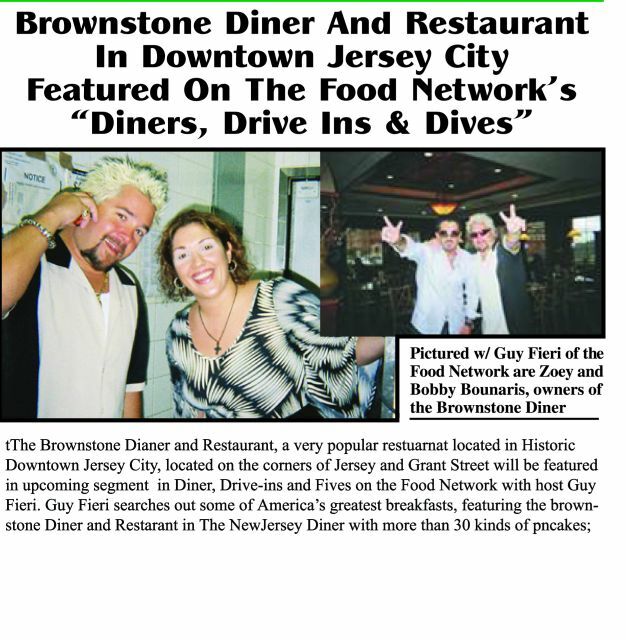 Zoe and Bobby are looking to expand the Brownstone to a new location in either Hudson or Bergen County and they’re also planning a renovation and expansion to the Jersey Avenue restaurant where they will add an outdoor patio, indoor-outdoor bar and enough space for private parties and events. But that won’t happen until 2012 and the Brownstone will remain open during the renovation. 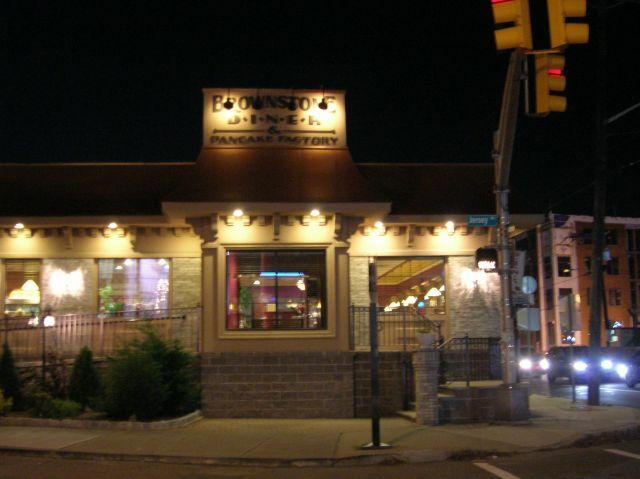 And if you have any trouble finding the Brownstone Diner & Pancake Factory, it’s on the corner of Jersey and Grand blocks away from the Turnpike Extension in Jersey City. 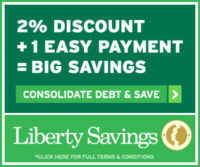 And if you’re a New Jerseyan, you probably know that.